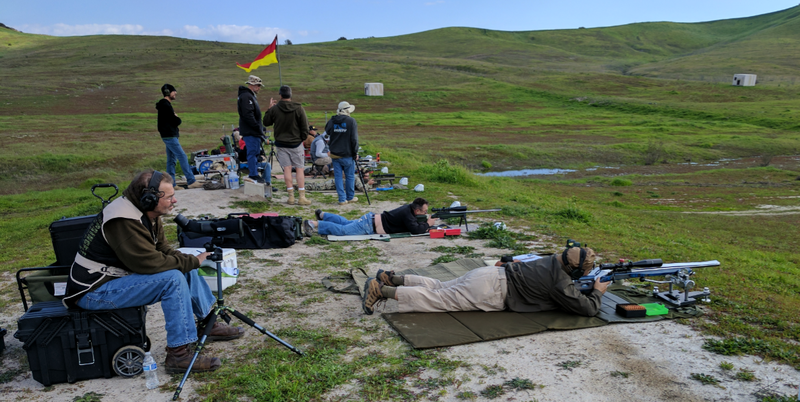 Welcome back everyone, this weekend marked the clubs first Long Range match of the New Year! 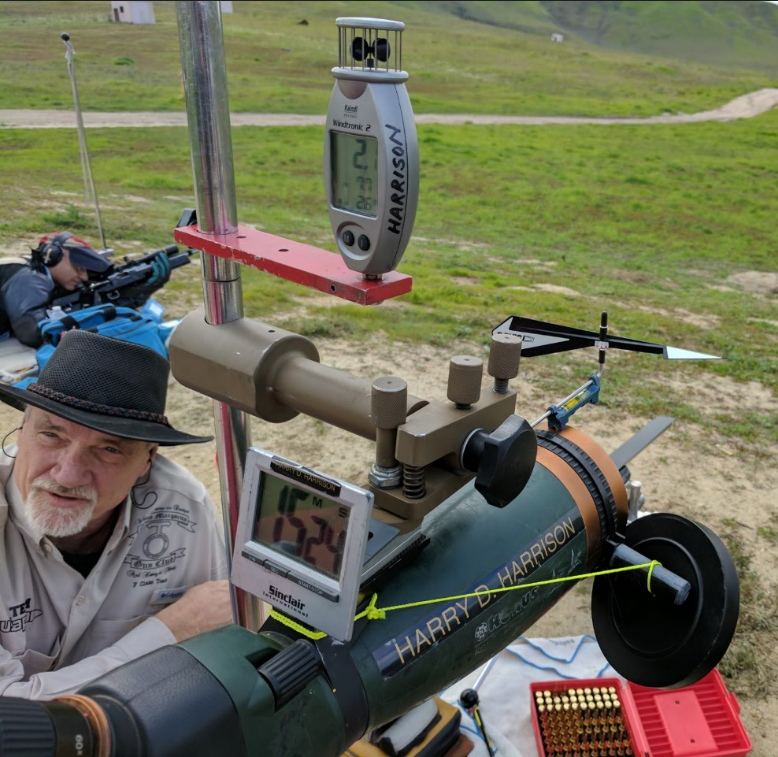 It was great to finally get back on the range for some quality time with our ballistic machines, and it was an important event for those heading to Phoenix for the Berger Southwest Nationals. Special thanks go out to the club and Mike Jones for arranging for competitors to find confidence in their 800, 900, and 1000 yard zeros. Harry Harrison also came out to lend a hand in gathering up new membership as well as to practice team coaching with our Club’s F-Class team members. Of course a big thank you goes out to our Corpsman which consisted of Van Texas and Rich Elliot on Saturday and Rich once again on Sunday. Without these guys watching over us round one would not be able to be expended. 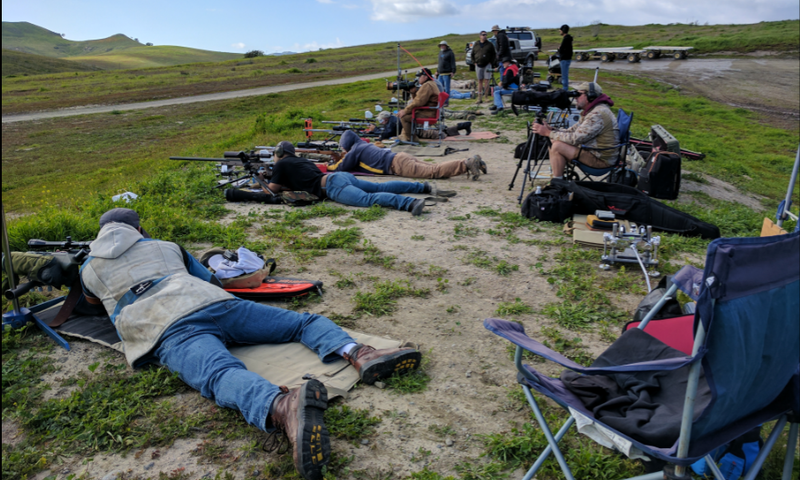 We had 18 participants over the two days of shooting even though national match preparation and Superbowl parties jostled in fierce competition of our fleeting weekend hours. It was a great turn out! The power and the beauty of Mother Nature’s whims were a sight to behold on base this weekend. As we arrived and assembled at range 116, we were treated to the rare and fleeting conversion of the normally arid scrubland into a vivid green rolling meadow as far as the eye could see in all directions. 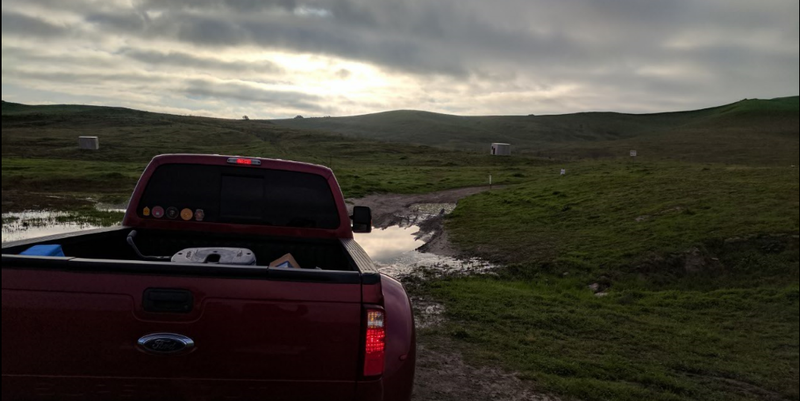 Said meadow was also endowed with plenty of mud and standing water making traversal of the various features of the range a little more precarious than normal. Of particular peril was ‘Lake Butts at the fording between the range access road and the pit access road. Our Saturday match consisted of unlimited sighters and twenty rounds for score at the 800, 900, and 1000 yard lines. Of course the 800 yard line was our first string, but it was our second water hazard! Hmm, was this once a golf course? It sure looked like it today! Finally assembled we commenced with the match, starting with our legendary safety brief by none other than John Hermsen our Club President and Chief RSO (pictured in maroon jacket below). We were all well advised of the normal perils of our regimen along with the not-so-obvious dangers from indigenous insect and aquatic visitors. The major floods that swept through the area and subsequent standing water hosted many things best left alone and undisturbed including certain species of shrimp and possibly young misguided whales. Off and running we all dialed in for 800 yards. This was unusual for the SMGC LR matches which are mostly 3×1000 events and a great opportunity to post some excellent scores. We were fortunate to have relatively steady but mild wind at the 800 line. 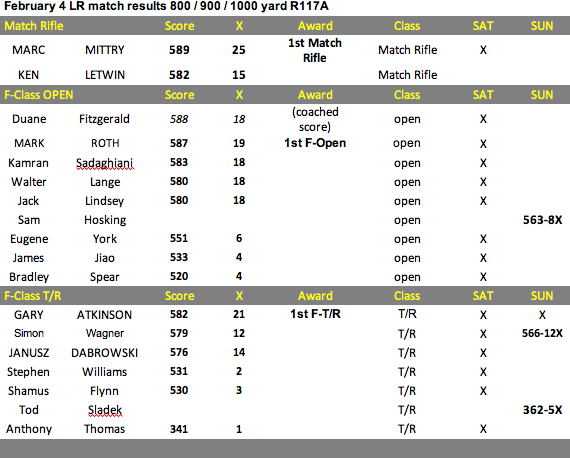 Speaking of which, in the photo below, Jack Lindsey was casually laying down a 200-12X on his second ever match event. That’s amazing! Way to go Jack! As you can tell by all the gear Harry isn’t messing around with making wind calls. Equally Duane (looking up at the camera) wasn’t either. 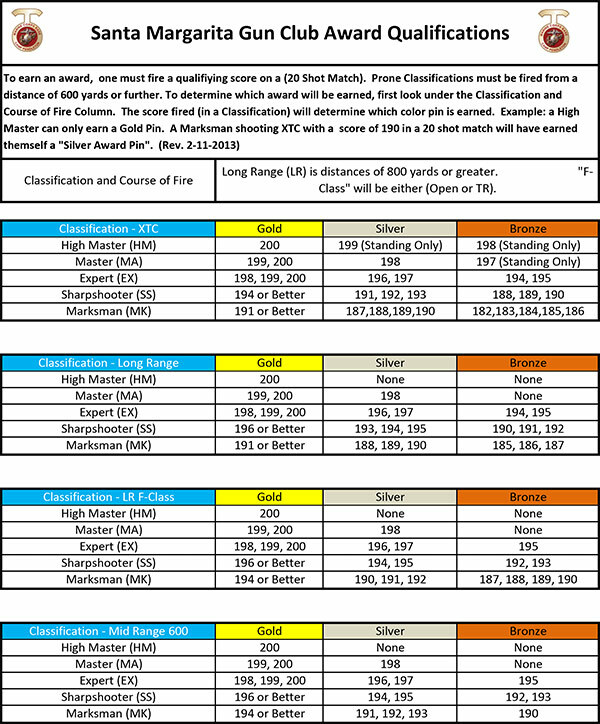 If his scores could be entered into the match he would have won the F-Class division Saturday in total. That said, Mark Roth (below in the foreground) gave him a run for his money! 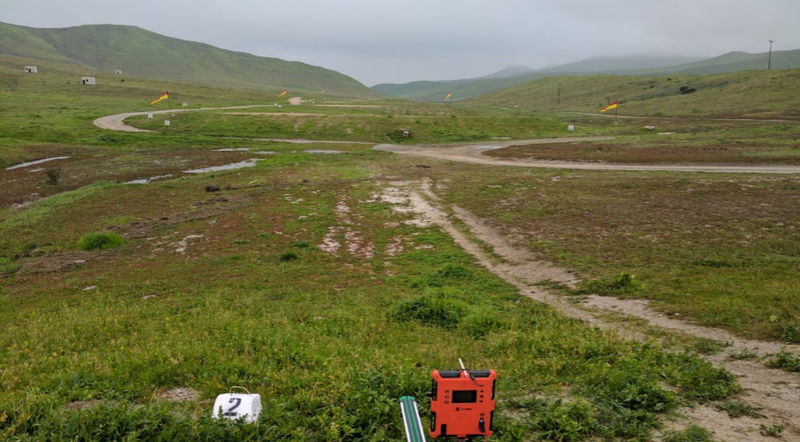 We pushed back to 900 yards and ran another relay, and as you can see here the flags are starting to play out their maddening contradictions that range 117A is well known for. Upon arrival at the 1000 yard line we encountered a new obstacle – foliage! Ken Letwin looks socked in here from this angle. Turns out the top of the mound wasn’t as overgrown as the edges. At the big end of the 1000 yard line there is a little more room the stretch out too. After suffering what Mike Jones officially dubbed ‘weird’ wind, our match winners were awarded at the end of the day. Gary Atkinson takes First in F-T/R Class as John Hermsen valets his prize money to him in style. Other achievements not photographed include Kamran Sadaghiani earning a Silver and Gold Club Award Pin. Simon Wagner earned two Gold Club Pin Awards. A competitor whom I wasn’t able to identify should have rightly earned some kind of prize for actually sticking a bullet in the target. Yes, the projectile was found lodged in the target face! The range always has the last laugh though. With all firearms put away the flags fall into unison. 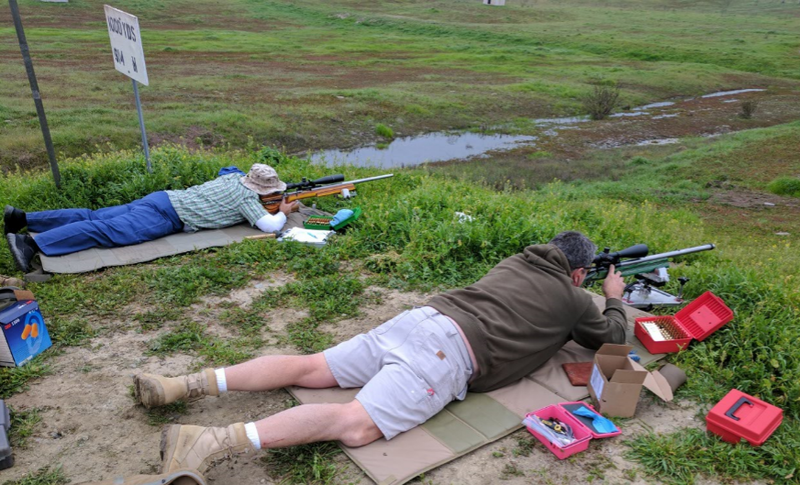 On Sunday most of the crowd was on to things other than LR rifle shooting, and this enabled another uncommon event. 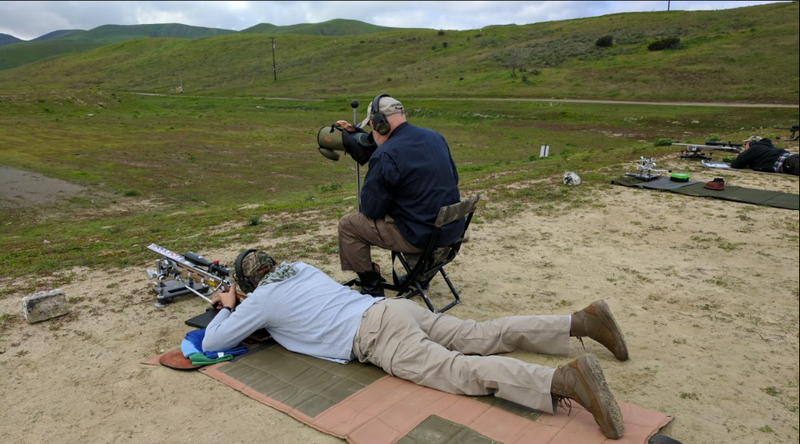 We were able to shoot with no pit changes, leaving our rifles on the line for the duration of the match, and at whatever pace we felt we could maintain. With only six shooters this meant we could get in and out to free up the afternoon. Sure enough we were leaving the parking lot of Range 116 by 11:30am! 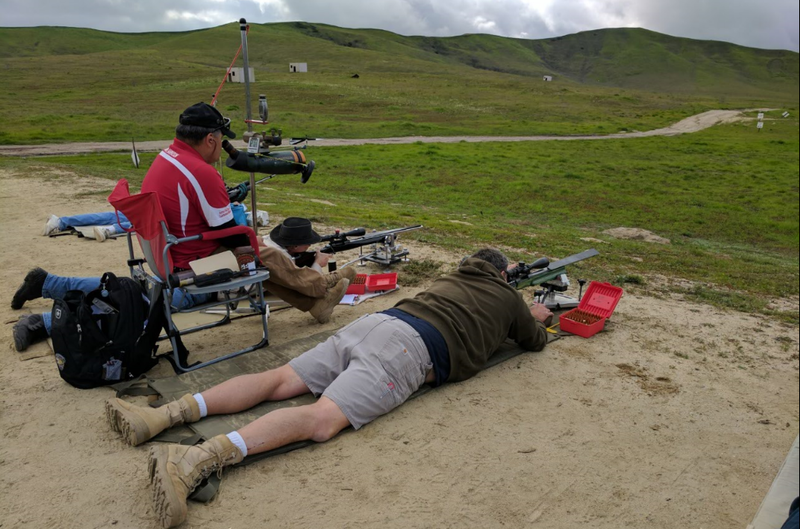 Gary Atkinson gives us a big welcome to the speed 3×1000 match of the day while Sam Hosking and Tod Sladek put the first rounds down range. One thing new we had to deal with on Sunday was low light. The oncoming storm due the following morning was bringing in a lot of low cloud cover and fog. This is where scope construction and light gathering capability started to be a critical factor. We also had the wind die all together and then switch back ever so slowly the opposite direction it had be drifting through that morning. It wasn’t uncommon to be right on your no-wind zero at some point in the morning. This lead to some great scores! Match results are posted below for both days. Best of luck and safe journey to those heading to Phoenix. Go Team Santa Margarita!